We must first note that all CAME-TV gimbals are pre-programmed and quality-tested to function right out of the box. No additional software tuning or firmware upgrades should be necessary. However, if you would like to make minor tuning adjustments with the SimpleBGC software at your own accord- such as changing joystick speeds, decreasing motor power, etc. 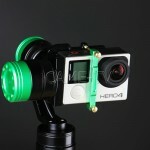 - we suggest that you first SAVE the gimbal's default, factory-programmed settings before making such changes. Should something go wrong as you're making the changes, you can always revert back and load the original default profiles. And please note that the profiles that you save contain settings that are unique to your gimbal. Sharing these profiles with other gimbal owners is not advised and can make their gimbal inoperable. And perhaps most importantly, under no circumstances do we advise upgrading your firmware. Doing so will wipe your settings and make your gimbal inoperable. The only way to potentially make it functional again would be to send it back to a CAME-TV support facility for repair (at your own cost if out of warranty). [IMPORTANT NOTE:] Your saved Default Profile is configured to the default Firmware installed on your Gimbal. If you attempt to upgrade your firmware, the saved Default Profile will no longer be valid. Posted in CAME-7000, CAME-7500, CAME-7800, CAME-8000, CAME-Action, CAME-Argo, CAME-Mini, CAME-Optimus, CAME-Single. Tags: came gimbal, came-7800, came-8000, came-gimbals, came-mini 2, came-optimus, came-single, firmware, min 1, mini 3, mini-2, pid tuning, simple bgc, simpleBGC, simplebgc software, software, tuning on August 9, 2016 by r p.
Below is a list of authorized versions of the SimpleBGC GUI software to use with our CAME-TV gimbals. Instructions for connection and use can be found here. 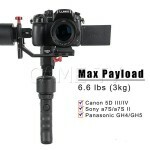 If you are unsure of which version below is appropriate for your gimbal, click HERE. 2.63 b0 Currently available for the CAME-Prophet gimbal only. Contact us if needed. 2.60 b4 Currently available for CAME-Prodigy and newer CAME-Optimus models only. Contact us if needed. 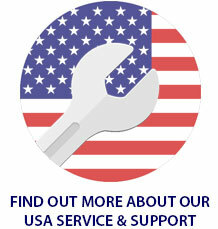 If you are in need of 2.60 b4, contact us first. SimpleBGC GUI software is developed and provided by BasecamElectronics.com. Posted in CAME-7000, CAME-7500, CAME-7800, CAME-8000, CAME-Action, CAME-Argo, CAME-Mini, CAME-Optimus, CAME-Single, CAME-Steadicam, FAQ. Tags: calibrate, calibration, gui, simple bgc, simpleBGC, software on May 27, 2016 by r p.
IMPORTANT DISCLAIMER: Please know that all CAME-TV gimbals come pre-programmed to properly function and stabilize right out of the box without the need for software tuning. However, if you choose to make adjustments using the SimpleBGC software, you do so at your own risk. If or when you choose to do so, we strongly urge you NOT to make any changes that are not recommended by us. Doing so may affect your gimbal's functionality, and may require you to send it into one of our facilities for repair at your own cost (if still under warranty). Before making any of the suggested changes below, we also advise that you save your current profiles once connecting and/or capture screenshots of each tab & profile. 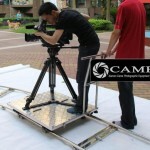 On the most part, the CAME-TV Single gimbal can be balanced and fully operated straight out-of-the box. However, with the introduction of encoders, the most minor tweaks in the SimpleBGU calibration software can cause the Single to act somewhat erratic. Unfortunately, there is no undo button, nor is there a singular factory reset switch that can bring your gimbal back to its original state. 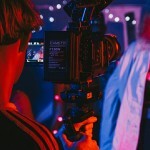 However, there is a very specific, yet simple 5-minute process that you can follow in order to get your gimbal functional again. Essentially, it will allow you to start over from scratch and remove any uncharacteristic behavior that you may have accidentally triggered. Tech media reviewer and colleague MrCheesycam breaks down this process step by step in the video below. Download the SimpleBGC software HERE. Download the CAME-TV Single Default Restoration profile if you are using SimpleBGC GUI version 2.55 b3 HERE. If you are using SimpleBGC GUI version 2.56 b7, then download and use the Restoration profile linked HERE. Not sure which SimpleBGC version you need? Click HERE. Please note that these restoration profiles are intended to work ONLY for the CAME-Single and will NOT work for any other gimbal model. NOTE: If you are only experiencing minor problems with your gimbal such as light shaking and vibrations, DO NOT follow the process above. Simply lowering your Motor Power can help eliminate those problems, as referenced in this article. Posted in CAME-Single, FAQ. 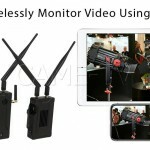 Tags: came-single, simpleBGC, single, small gimbal, tool-less gimbal on August 28, 2015 by r p.
One of the more useful functions of any CAME-TV gimbal is the built-in joystick/remote control feature. 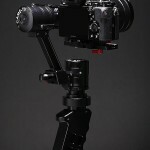 Simply enough, the 2-axis joystick essentially allows you to do seemless panning and tilting movements while maintaining smooth and steady shots with the gimbal. 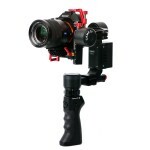 However, all gimbals come with a pre-programmed joystick speed that dictates how fast its movements are. And sometimes this default speed isn't ideal for the shot that you may want to execute. But luckily, speed can easily be adjusted using the SimpleBGC software. Full step-by-step details are shown in the video below. Posted in CAME-7000, CAME-7500, CAME-7800, CAME-Mini, CAME-Single, FAQ. 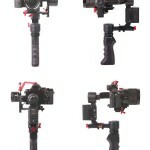 Tags: 7500 gimbal, 7800 gimbal, 8000 gimbal, a7rII gimbal stabilizer, came gimbal, came-7500, came-7800, came-mini, came-mini 2, came-single, came-tv, came-tv gimbal, cametv, gimbal, gimbal rc joystick, joystick speed, simpleBGC on August 22, 2015 by r p.
Gimbals can work with either one or two IMU sensors. One sensor is placed above the camera to track camera positions, and the second (optional) is typically mounted to the vertical frame post for tracking frame angles. If you are using a Dual IMU system and cannot click on the Frame IMU button, it's possible this option has been disabled. 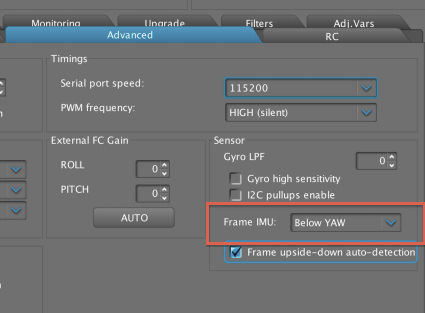 Click over to the Advanced Tab and change the option for Frame IMU to Below YAW. Next Click the Write button to save your changes. Now return to the Basic Tab and try to select the Frame IMU button for your options. Posted in CAME-7000, CAME-7500, CAME-7800, CAME-Mini, FAQ. 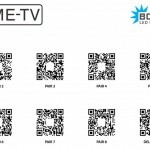 Tags: alexmos, basecam, configure frame IMU, frame imu disabled, frame imu not available, greyed out imu gimbal, simpleBGC on July 31, 2015 by cametvblog. Brushless Motors can be wired to spin in clockwise or counterclockwise, and the software to control them can automatically change directions. Motors on Gimbals can also be mounted in many different ways, so the software needs to detect which way is the proper rotation for your setup. This is when you may need to use the Invert option under Motor Configuration. IMAGE IS AN EXAMPLE. DO NOT COPY THESE INVERT OPTIONS DIRECTLY. FOLLOW INSTRUCTIONS BELOW. Before starting this process make sure you have the Sensor Orientation setup correctly. This information is required when checking Motor direction. 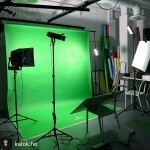 If you are unsure about your Sensor positions, check this article. Once you have your sensors setup correctly, follow the instructions in the video below to determine if any of your Motors require the Invert option selected for your Gimbal. 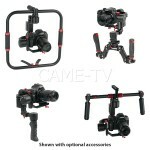 We understand that many people want to Tune their Gimbals for different characteristics. But instead of downloading and sharing profiles, Keep in mind that Profiles carry several settings that are unique to your system. Instead of downloading and installing complete Profiles just for PID settings, we suggest just changing your PID settings manually through the software. This way you don't affect other settings such as Motor Invert Options, RC Settings, Sensor Positions, Follow Modes, etc. 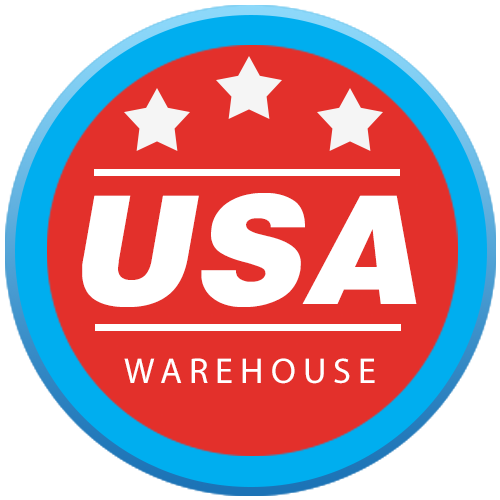 Posted in CAME-7000, CAME-7500, CAME-7800, CAME-Mini, CAME-Single, FAQ, Uncategorized. Tags: alexmos, Check invert option gimbal, default gimbal profile, dual imu, Motor Invert Joystick, SBGC, simpleBGC, tuning PID on July 31, 2015 by cametvblog.